My husband's cousin had a wedding celebration this past weekend in New Jersey. 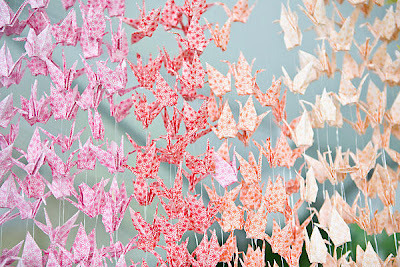 I thought it was so cute that they included an origami crane in their invitation. Shortly after I received their invitation, I coincidentally read about this project via One Sydney Road. And I placed it on a bench in front of a movie theatre in hopes that somebody would find it. I imagined somebody on a date finding it and secretly tucking it into their bag. Congratulations Bob & Steff...wishing you love, laughter, and happy ever after! love it! and how cool is it that such an awesome looking movie theatre is located on lover's lane? we live in the wrong state up here, i tell ya. Ooh, how fun! I love it! I wonder who found it and what they thought? Great placement!! I'm glad you were able to take something away from my project. It's kind of fun, isn't it? :) Hopefully the person that found it appreciated it bunches. Side note: I love the paper crane related wedding stuff. Great idea! Missing Dallas with the Lovers Lane! Such a wonderful thing to do. 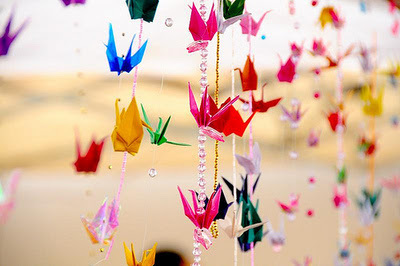 If you shop on etsy.com, you can find paper crane mobiles. They are just beautiful.